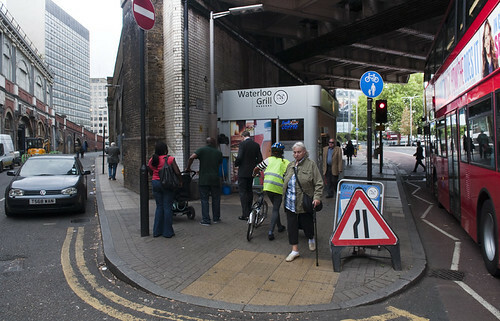 Riding up to Waterloo recently, I spotted a wonderful collection of pavement obstructions — roadworks signs, a fast food kiosk that takes most of the width of the footway, and A-board advertising the fast food kiosk just in case you hadn’t spotted the kiosk itself, and a fixed shared-use cycle/footway sign, designating this pavement as a place to ride your bike. It’s not entirely clear from the sign’s position and jaunty angle whether the shared-use applies to the narrowed pavement outside the kiosk, or the even narrower pavement alongside the Charing Cross railway arches. The latter could be a useful route up to Waterloo (up the ramp in the distance on the left) avoiding having to go through the roundabout and bus station (beyond the traffic lights on the right), though it would make a lot more sense just to add “except cycles” to the “no entry” sign on this little-used one-way street. But I realised later that it’s probably to take you up to those traffic lights, which control a toucan crossing allowing one to make the right turn into a quiet side-streets route without having to pull across two lanes and wait in the middle of the road for the oncoming traffic. 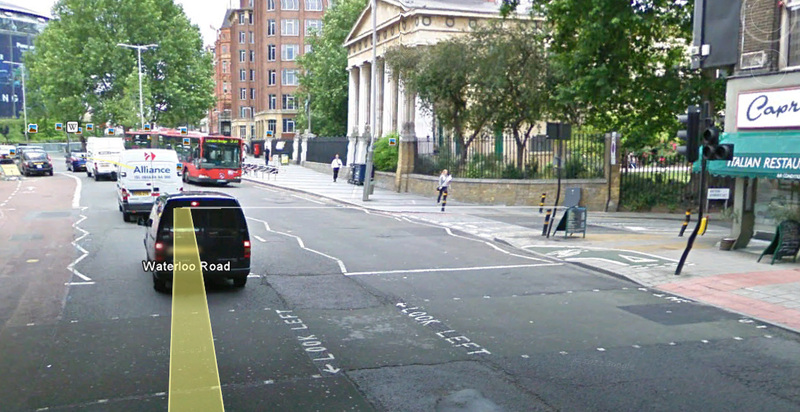 There are dozens of ways this could be improved, by moving the kiosk out of the way, moving stop-lines back on the oncoming carriageway and on the no-entry side-street, and having a proper bit of cycle track leading into the crossing. Just as Haarlem patched the ugliest bits of this ugly road, one can imagine a great many far superior ways to deal with this crossing. But anything you build to serve this crossing is always going to be far from satisfactory because the entire concept is wrong. There should be no need to cross here at all because the recommended cycle route shouldn’t be meandering down little side-streets like Exton Street. If you want people to cycle, you need to give them an attractive, direct, easy to follow route, that doesn’t waste their time with constant changes of direction and checking of signs. Main roads like this need a complete rebuild — as they tend to get every few decades anyway — but with proper thought and planning. It’s not difficult to see where the space can be taken from vehicles (and kiosks) on this road of bloated traffic lanes to provide high quality dedicated space for cycling. 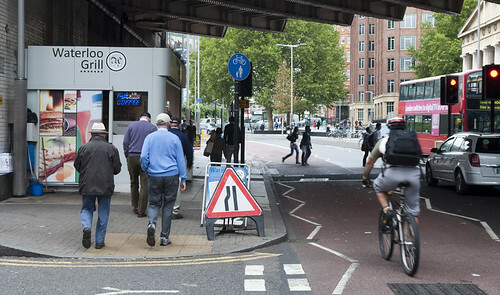 Until that happens, trying to route cyclists through cramped and crowded bits of pavement kinda makes TfL and Lambeth look like a bunch of idiots.